The Trinity Police Department in Texas posted this YouTube video to educate the public about how fast things can turn bad for officers even on a simple traffic stop. The video contains no disturbing violence and should be shown to middle and high school age students as well as the rest of the community. We put together a quick video from an arrest that happened this past weekend. The video will show two things. Based on the dash cam video, you might assume that Officer Wheeler is being overly aggressive towards the driver for no reason. If Officer Wheeler would have shot the driver, it could have sparked an outrage based on that limited view. 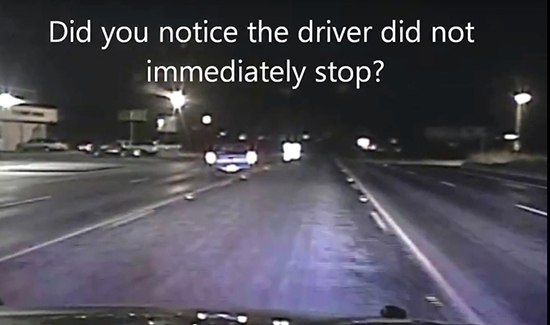 Now, with Officer Wheeler’s body camera you will learn how dangerous the stop could have been. Officer Wheeler had a split second to decide to shoot or not to shoot the driver. The next time you see a questionable video involving law enforcement, remember this video and remember there could be more to it that you cannot see. Show your intelligence by reserving your judgmental comment until the facts are revealed. – Chief Steven Jones, Trinity, TX Police Dept. I appreciate this very informative video. Too many people just don’t understand the things that our police officers have to go through. Thank you.